· The suburban train coaches made in Integral Coach Factory, Chennai, have features of cushioned seats in First Class and Polycarbonate seats in Second Class for better aesthetics and passenger comfort. These coaches also have provision of forced air ventilation, passenger information and announcement system, stainless steel fixtures, Light Emitting Diode (LED) tube lights, etc. Other features for passenger safety include, stainless steel coach body, improved design rigid hand holds, slip free grab pole, etc. in the coaches. · Facilitating passengers and reducing trespassing by building of more Foot Over Bridges, provision of escalators and lifts, blocking gaps in the boundary walls on either side, fencing of the area between two platforms so that the people are not tempted to jump from one platform to another by crossing tracks, Reducing gap between coaches and platforms. · Stringent and regular inspection of all safety items are carried out during scheduled inspections as specified by Research Design and Standards Organization (RDSO). · In Western Railway suburban system Auxiliary Warning System is in place to prevent collision in case of Signal Passing at Danger (SPAD). · Public awareness campaigns are organized by Railway Protection Force (RPF) to brief the public about the hazards of crossing tracks, roof top traveling and stunts. · Ladies special trains are being escorted by lady RPF staff, wherever available, in sub-urban sections. · The ladies compartments in local trains are being escorted by RPF and GRP during peak /non-peak hours. Staff deployment is made during late night and early morning local trains to ensure proper security to the lady passengers. · Shakti Mahila teams headed by Lady RPF officers and Nirbhaya Squad headed by GRP official have been formed over Central Railway to act against the offenders harassing women passengers. · 12 Mahila Vahinis (women RPF companies) have been sanctioned to strengthen security of women passengers in suburban section of metropolitan cities. · Security Help-Line number 182 has become operational in Zonal Railways’ Control Rooms to enable passengers to seek security related assistance on real time basis. · A daily average of 1300 trains is escorted by Railway Protection Force. In addition 2200 trains are escorted by Government Railway Police of different States. · To empower the RPF to create a more effective security mechanism over Indian Railways, a proposal for amendment in the RPF Act has been moved by the Ministry of Railways with the approval of the Ministries of Law and Justice and Home Affairs. · An Integrated Security System (ISS) including electronic surveillance through Close Circuit Television (CCTV) to enhance security over 202 sensitive and vulnerable railway stations is under implementation. · RPF holds regular coordination meetings with State Police at all levels to ensure proper registration and investigation of crime by GRP. · A Mobile App named “M-Indicator” has been launched by Railways in Mumbai Sub-urban section in the Month of January, 2015. · Regular Drives against man entering coaches reserved for ladies by RPF under section 162 of the Railways Act. Railways have introduced an Automatic Freight Rebate Scheme with effect from 25.06.2015 wherein all loaded rakes in notified empty flow directions are charged at Class LR1 for trainload traffic and at Class 100 for wagonload traffic. Customer does not need to apply for availing benefit under the scheme. The rebate is automatically granted to customers through Freight Operation Information System (FOIS). This scheme is applicable to (i) all Goods Sheds, Sidings and Private Freight Terminals (PFTs) and (ii) wagons of BOXN group, BCN & BCNHL group, BRN and BOST group and CONCORD rakes. Coal and coke, minerals and ores, POL traffic etc., and commodities under Class LR2 and Class LR3 are not eligible under the scheme. Since the scheme has been introduced recently, it is difficult to estimate the additional revenue likely to be generated through this scheme. The Ministry of Railways has signed a Memorandum of Understanding (MOU) with the Life Insurance Corporation of India (LIC) on the 11th March 2015 whereby LIC has agreed to provide funding assistance to the tune of Rs.1,50,000 crore over a five year period from 2015-16 to 2019-20 for financing Railway projects. 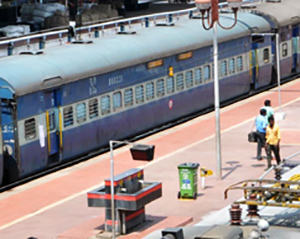 The Railway Budget envisages raising Extra Budgetary Resources to the tune of Rs. 40,572 crore in the year 2015-16. This consists of Rs.17,655 crore as market borrowing through Indian Railway Finance Corporation Limited to finance rolling stock and a few projects being executed by Rail Vikas Nigam Limited, Rs. 17,136 crore as institutional finance and Rs. 5,781 crore as investment in Public- Private Partnership projects. Action has been initiated to achieve the related targets and progress is continuously monitored. (i) Special Freight Train Operator (SFTO) Scheme – For high capacity and special purpose wagons for transportation of selected commodity. Proposals have been received from two parties for procurement of three rakes by each party. (ii) Automobile Freight Train Operator (AFTO) Scheme – For transportation of automobiles traffic with suitable design and higher throughput. Proposals have been received for procurement of 12 rakes from two parties. Out of which, 6 rakes have been inducted and running on Indian Railway’s system. (iii) Railways have introduced an Automatic Freight Rebate Scheme for traffic loaded in traditional empty flow directions w.e.f. 25.06.2014 wherein all rakes loaded in notified empty flow directions are charged at Class LR1 for trainload traffic and at Class 100 for wagonload traffic subject to certain terms and conditions. In addition, an incentive scheme for Freight Forwarders is already in place since 2006, which facilitates cargo aggregation. (iv) Container Train Operators Policy - This was opened in 2006, where Private Container Train Operators were allowed to operate container trains for movement of both domestic containers as well as EXIM (Export-Import) containers. While these rakes are owned by Container Train Operators (CTOs), Indian Railways hauls their rakes and realizes haulage charges. At present, there are 387 container rakes owned by Container Corporation of India Limited (CONCOR) and 16 other Container Train Operators (CTOs) who have obtained licenses to operate. During last financial year, container traffic loading on Indian Railways was 48.83 million tonnes registering a growth of 12% over 2013-2014. (c) Under these schemes, rakes are procured by the private parties, as such, the question of allocation of fund in this regard does not arise. Improvement of catering services is an ongoing process. Steps taken/being taken to further improve the catering services include (i)Third Party Audit of catering services to be conducted at periodic intervals by independent and reputed auditing agencies accredited by NABCB (National Accreditation Board for Certification Bodies) as empanelled by the zonal Railways. (ii) Introduction of e-Catering so that passengers can book the food of their choice through internet (iii) Introduction of Pre-cooked Food (ready to eat) meals of reputed brands to improve the quality, hygiene and to provide variety of options of meals to the passengers (iv) Setting up of centralized Catering Services Monitoring Cell (CSMC) with a toll free number 1800-111-321 for prompt redressal of the passenger grievances related to the catering activities and real time assistance to travelling public. (v) Imposition of stringent punitive action including heavy penalties in case of deficiencies in services. Further, transparent contract awarding and management system has been laid down in Catering Policy, 2010. Standard Bid Documents (SBDs) for award of general minor units, major static units and mobile catering units (Pantry car) have been issued. Safety is the prime parameter in construction of any railway project. Depending on the nature, complexity and scope of work, safety aspects are examined at various levels. For simple type of projects in plain areas, the safety issues are examined by zonal railways. RDSO is consulted in case of any complexity involved. However, in very complex projects like Katra-Banihal Rail Link, a multi-tier study about safety is done by engaging consultants of national and international repute. In Katra-Banihal section, various institutes and consultants of national and international repute have been engaged to study safety related aspects which include Indian Institute of Technology (IIT)/Delhi, IIT/Roorke, Indian Institute of Science/Bengaluru, M/s Geodata SPA Italy, M/s Amberg Engineering/Switzerland, M/s. Lombardi M/s SNC Lavalin Infrastructure Pvt. Ltd/Switzerland, M/s Bernard in Genieure/Austria, ITASCA/USA, etc. A work costing Rs. 36.24 crore has been sanctioned for mapping of all fixed Railway assets on Geographical Information System (GIS) of Bhuvan Satellite Imagery of Indian Space Research Organisation (ISRO) integrated with Track Management System (TMS) of Indian Railways. This system would provide the status of Railway land whether encroached or not and thus would be helpful in tackling the menace of encroachment. Indian Railways have a system of scheduled inspections and patrolling by Railway officials which includes Keyman’s daily patrol for monitoring of tracks including those existing in lonely locations in the country. In addition, protection and security of tracks and bridges is the statutory responsibility of States which is being discharged by them through concerned District police. Necessary coordination/liaison is maintained by RPF with GRP and district police to ensure smooth train operation over Indian Railways. In a drive conducted by RPF during ‘Railyatri Upbhokta Pakhwada’ a fortnight long passenger and customer facilitation programme, as many as 34985 people including hawkers and vendors were arrested. The arrested people are prosecuted as per law and the fine realized is the part of State exchequer. Policing on Railways is a State subject and prevention of crime, registration of cases and their investigation in Railway premises as well as on running trains are, therefore, the statutory responsibility of the State Governments, which they discharge through Government Railway Police (GRP). Railway Protection Force (RPF) supplements the efforts of Government Railway Police by deploying its staff for escorting of important trains in affected areas and access control duties at important and sensitive stations. 1. An Integrated Security System consisting of electronic surveillance of vulnerable stations through Close Circuit Television Camera Network, access control, Anti-sabotage checks have been finalized to strengthen surveillance mechanism over 202 sensitive railway stations. 2. On vulnerable and identified routes/ sections, 1300 trains (on an average) are escorted by Railway Protection Force daily, in addition to 2200 trains escorted by Government Railway Police of different States daily. 3. RPF holds regular coordination meetings with State Police at all levels to ensure proper registration and investigation of crime by Government Railway Police. 4. RPF Crime prevention and detection squads and special teams are formed to keep vigil on the criminals in trains/ stations to prevent crime. 5. Frequent announcements are made through Loud Hailers and PA system, advising the passengers to take precautions against theft, drugging etc. 6. Joint drives by RPF/GRP and Commercial Department are conducted from time to time against the unauthorized entry of passengers in trains and railway premises. 7. Crime intelligence is collected and action is taken thereafter as per law against unlawful receivers of Railways property.